Creating an alternative Christmas wreath | gingerbread smiles. As you well know by now, I've recently been getting very crafty creating homemade gifts, keepsakes and giveaways. Whilst getting in the Christmas spirit I was contacted by Turtle Mats who asked if I'd like to create my own Christmas wreath. It sounded challenging but I was willing to give it a go. I've never had a Christmas wreath before so I thought this would be the perfect opportunity to add one to our Christmas decorations. Rather than make a common Christmas wreath using greenery, berries, dried orange and other bits and pieces I decided to go a totally different direction and use wool. I thought that this would create a more long lasting wreath but also it would be something that no one else has. I was sent the wreath frame and a voucher to buy some other items to create the finished article. I ordered four balls of wool, two green, one white and one red. I did have an inital plan as to what I wanted my wreath to look like, but as I was making it, the design developed and changed but I'm happy with my final piece. 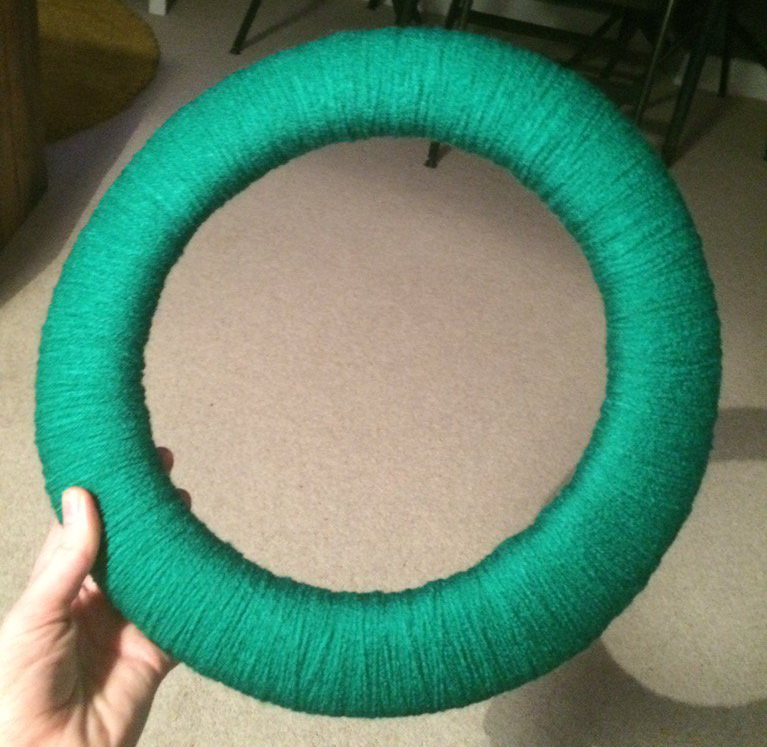 I started my wreath by wrapping the green wool around the frame. This was extremely time consuming and monotonous but it created a great base for my other decorations. It probably took around 4 hours to complete whilst watching TV. It was slightly relaxing but quite painful for my hands wrapping the wood around for so long! When I'd completed the green, I took a break, then got back to it and decided to wrap the red and white around sparingly with bells threaded on to give it a festive feel. This by itself look great but I wanted to add a little extra to it. I made some white and red pom poms by hand using this Youtube tutorial and it was very easy. It took a bit of time as I had to wrap it round my hand, tie it up and then give them a haircut. This is the part that took the most time and made the most mess. With each pom pom I ensured the knot around the middle left enough wool to tie it to the wreath. I was going to try to make some salt dough gingerbread men for this (hence the cookie cutters in the first picture) but after putting the pom poms on, I thought it would look good without them. So what do you think of my homemade alternative Christmas wreath? Worth the effort? *Collaboration with Turtle Mats - they provided the wreath frame and voucher to purchase other items but content is my own.